Another beautiful week is here, and I have for your another fabulous Monday Morning Glamour photo to inspire you and lift those Monday blues. This week I have for you the stunning Hedy Lamarr, an incredible actress and inventor. 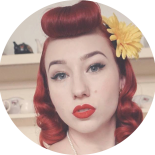 This entry was posted on April 10, 2017 by Miss Lady Lace in Uncategorized and tagged 1940's, 1950's, blogger, glamour, miss lady lace, miss lady laces pinup blog, perth burlesque, perth pinup, perth pinup blog, perth pinup community, pin up, pinup, pinup blog, pinup blogger, pinup fashion, pinup girl, pinup life, pinup lifestyle, pinup perth, red lips, retro blog, retro girl, retro glamour, the perth pinup community, victory rolls, vintage, vintage blog, vintage blogger, vintage fashion, vintage girl, vintage glamour, vintage perth, vintage pinup blog.